The symptoms were there but it was not known to me or to my family for quite many months until last week. Like many people I had been unknowingly affected by cooking shows and it was too obvious not to see what I was doing. The first sign of it showed on one weekend morning when I realised I was talking to myself. I had been making our favourite breakfast Upma. “First we chop these ‘lovely’ onions very finely. Don’t we all love the aroma of onions frying in oil”, I whispered. “Next chop these hot green chillies and these ‘gorgeous’ plump red tomatoes. Make sure that you have sharp knife so that tomatoes are chopped into nice small chunks without much difficulty”, I said flashing all 31 teeth to my virtual audience who were watching my actions keenly. “Pick few coriander leaves and chop them very finely…. Mmmm… I love the fresh smell of these coriander leaves and always end up adding more”, I winked at my fans. “You know what the trick behind good Upma is? It is to roast the semolina in low flame till it turns golden brown and to add water little by little when cooking”, said to my all impressed audience. Coming back to Cookery shows, Ginger-Potato Curry is adapted from the recipe demonstrated by Rakesh Sethi of Mirch Masala fame. With free-view channels with our TV package, I came across this show on Star Plus and watched Mr. Sethi cooking this dish which immediately caught my attention. This was the first time I came across a recipe which uses so much of deep fried ginger and using it as the main ingredient in a curry. With Sunita hosting this month’s Think Spice event where she asked us to cook with Ginger, I could hardly stop myself from giving it a go. I have made few changes to the recipe to suit my taste. Chef Rakesh used 1 cup of ginger julienne for 250 gms of baby potato which I thought will be too bitter and spicy for our palate. I added 1 tbsp cashew paste because I wanted little thick gravy than thin watery one. It was spicy, sour and sweet with tingling taste of fried ginger and sweet taste of baby potatoes and it tasted better the next day when potatoes nicely absorbed the flavours. Next time I might roughly mash potatoes for the flavours to blend well. So with all these changes here is my Ginger-Potato Curry. Place tamarind pulp in ½ cup of hot water for around 10 minutes. Squeeze the pulp and collect the puree and discard the pulp. Mix turmeric powder, red chilli powder, tamarind puree, salt to taste with ½ cup of water. This is the basic marinade for the potatoes. Prick cooked and peeled baby potatoes with fork and place then in the marinade. Mix them well and keep aside for around 15 minutes (Chef didn't marinade the potatoes and used it directly). After 15-20 minutes, separate the potatoes and the marinade. Deep fry ginger juliennes in heated oil in a slow flame till they turn brown and crisp. Drain them on paper towel and keep aside. Heat 1 tbsp oil in a pan and add mustard, red chillies, hing and curry leaves. When mustard starts to pop and splutter, add marinade mixture carefully and mix well. Bring this mixture to a boil at medium flame. Now add fried ginger, kasuri methi, brown sugar/jaggery, cashew paste and mix well. Cook for further 5 minutes stirring occasionally. Add baby potatoes and methi powder and cook over a low flame for 10-12 minutes till all the flavours blend well. Serve hot garnished with coriander leaves with rice or roties. Looks beautiful. 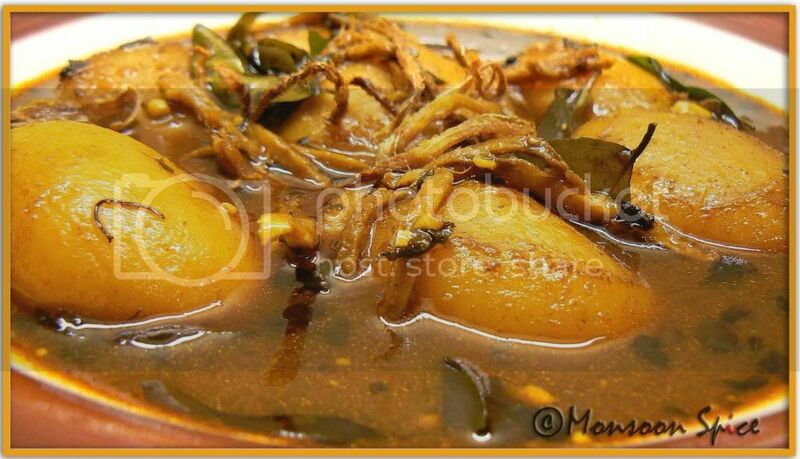 Potatoes and ginger floating in a spicy and tangy sauce. No onions or tomatoes? Wow. I have to try it. Curry looks delicious Sups! Actually reading through the post made me laugh out loud.. u do sound like the many TV chefs :-) Giving Rachel Ray a run for her money???? wow Sia!! I loved the curry, but more than that I loved your shots of the Raw Ginger...great job! Sia, you not the first one to fall under Jamie Oliver's and Food Tv's spell, I would have given a million to watch you perform for your audience :) Ginger Potato looks and sounds wonderful I am sure tasted great too. i agree. jamie is the one. i saw a sanjeev kapoor show on youtube recently where he has a skimpily dressed bimbo next to him as a prop. wonder why he needs her on the set. is a kitchen incomplete without a woman? oh lovely!!! My mom used to make something similar with baby potatoes... Yours look heavenly.Lovely pics as always. Thanx for the recipe. fried ginger have not thought of it ever. this will go on my try list dear! The cutest EVER read! he he, i am chuckling :-D. I do that too sometimes, while making UPMA, that is ;). And no, thats not from cooking shows, i say my blog posts in my mind, he he :-D. And whats making me even more thrilled is that you were talking about upma-that totally made my day! To top it all, you have a curry that features ginger and potatoes-double dose of yumminess there :). Sups, tum sachi mein great ho :). Hey, and i love the placement of (???) after "delicious food"-from some of the cooking shows ;). You'll beat them hands down any day! hhaa...so true on the cooking show!...and dish looks great..but I don't think I can ever try with so much ginger!..I somehow like garlic but never ginger! what an amazing post, I was smiling throughout.That dish looks very different and very new as well.love those pictures!! I too watch cookery shows and u know i hate to watch Nigella, it doesn't look like cooking to me, I know i am harsh but i feel Jamie comes first and Antony Worral thompson next!! and hey you might see my recipe this saturday on his saturday show!! Sia, which channel are u airing ur first show? Let me book my time first. Uppittu (concrete) isthu sakathagi varnisidira andre eega uppittu thinbeku antha anistha ide. Potato curry is looking awesome with fried ginger. Am not too big a fan of ginger, but your curry sure looks amazing. I'd make it minus the whole lot of ginger. I loved your narration. That was funny! I haven't watched much Nigella but was she the inspiration for this post? Its looks like Pulusu(stew) we make. I have never combined tamarind potatoes . I'm sure it tasted great. Haahaa, that was one funny post suppi. I was glad to know there is someone else who is as crazy as me. I do that in kitchen as well and A has laughed about it a million times. hee hee. The pictures of the curry are gorgeous as always. I love the way those golden baby potatoes shine. 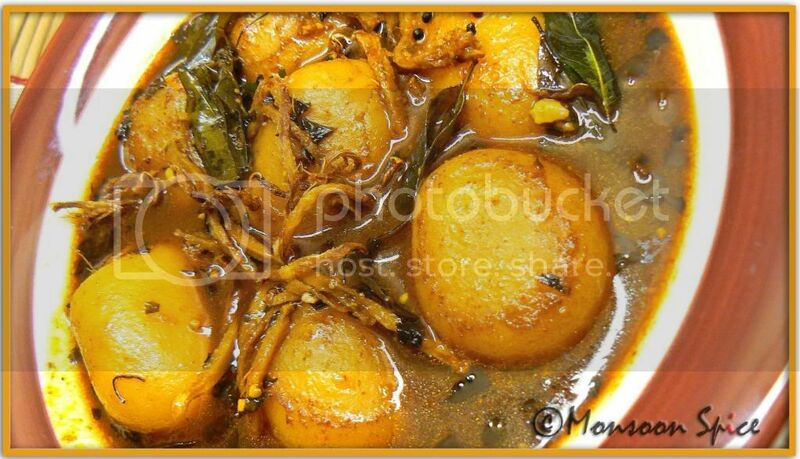 Gingery Aloo looks great, thin sauce I am not sure but might work with all the good spices! 1 cup ginger! whoaaaa! that is one HOT curry ;) fried ginger, now that sounds yum, how did it taste btw? was ginger strong even after frying? looks yum. oh yeah! those shows keep playing in my mind all the time :) pretty relaxing, i wud say!! I *want* to see a video of this! Fantastic idea! I ve never had fried ginger like this. You are such a creative one! wowww!!! fantastic pics sia!!! sounds interesting fried ginger with baby potatoes curry !! As myhubby got 4days leave for thanksgiving...planning to visit my sister place which is just 4hours drive. Looks amazing... Ginger flavour curry is perfect for Jeera rice. Thanks for sharing. yellow, red and green curry? r u by any chance talking abt thai curries? if u like thai curries i have already posted red and green curries here. pulusu han? do u use fried ginger and tamarind there? thin sauce tastes really good with white rice, just like neeru saaru or ganji saaru we make. yeah, thats what even i thought when he used 1 cup of ginger. fried ginger still remains hot but comparitavely less hot than raw. i am not sure if we can bake it. but baking just 1/4 cup of ginger is waste of time and gas i feel;) it hardly absorbs oil when deep fried. so u can give it a try mallika. 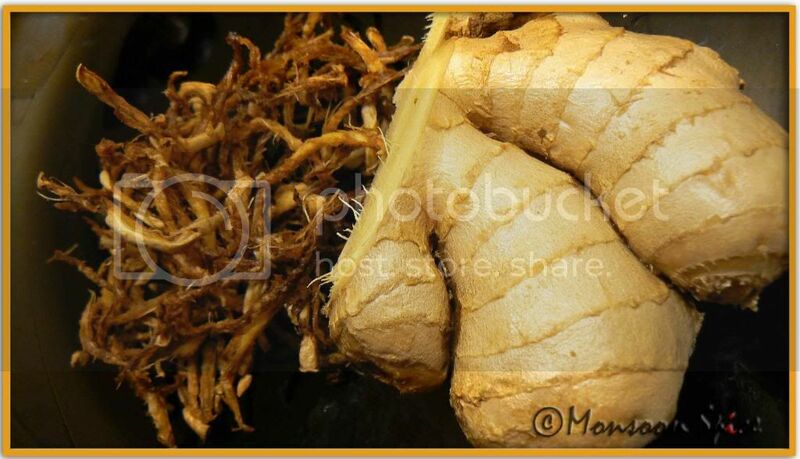 u can use fried ginger in salad dressing and soups also. tastes good and gives extra crunch and punch. You've gotta a mail!!!! !Please check it!! The ginger potato curry looks delicious. Hi hi i too watch some of the shows you mentioned. Looks yummy, Sup! Just saw your comment about Jan/Feb being cold and wet. The plan is to stay for 4 days, 2 of which we have to spend in Manchester. Do send me your number, I'll call you for sure. It'd be great if we can meet up too. 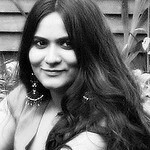 lol, I can't stop laughing picturing you looking into the imaginary camera and talking to yourself in the kitchen... that is something I've never done, and I thought I was crazy ;)...but may be this will come true, you might be hosting your own show one day... That curry looks delicious! Ginger is a sure winner.. Superb pictures and great entry!! 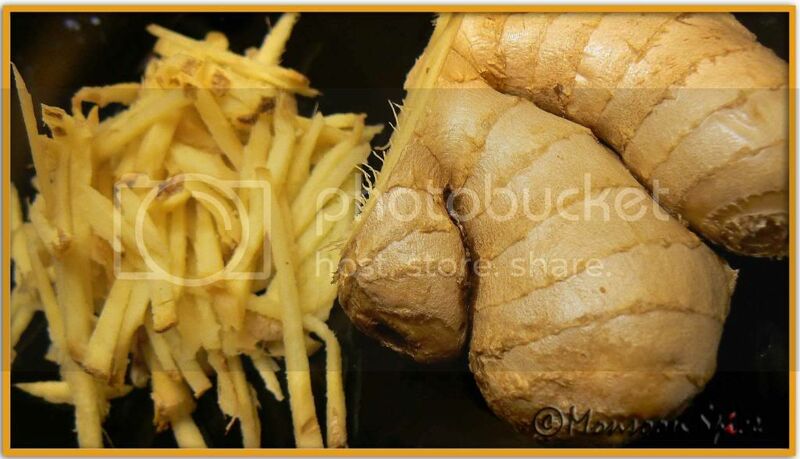 Lovely pics of the ginger..curry looks yumm. I have nominated you for the best photography (Best Food Blogs Awards over at http://wellfed.net). Your pictures and ideas are simply divine, good job, girl!